Comments are enabled by default on posts and disabled on pages. Quick Edit opens the post options letting you configure features such as title, status, passwords, categories, tags comments and the timestamp without having to edit the full post. 3. Hover over it’s title to bring up the action menu and click on Quick Edit. 4. Check or uncheck ‘Allow Comments’ then click on Update. 3. Select Edit in the bulk actions drop down menu. 4. Now select ‘Allow’ or ‘Do not allow’ from the drop down menu next to Comments and then click Update. 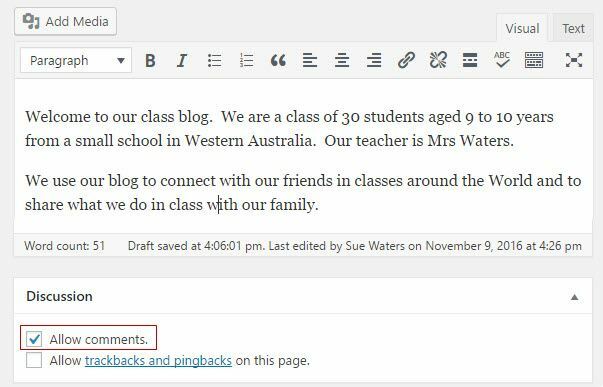 To change the comment settings for a post or page you already published you can open the post or page for editing and check or uncheck ‘Allow Comments’ in the Discussion module and then click Update. By default, new blogs have the Discussion module hidden. 1. Click on Screen Options in the upper right corner of your dashboard when you have a post open in edit mode. 2. Check the checkbox next to Discussion. Once the Discussion module is revealed you’ll see it appear below your Editor. 1. Scroll down to the Discussion module. 2. Check or uncheck ‘Allow Comments’. Any changes to published posts or pages only apply those posts and pages. Refer to enable and disable comments on future posts here.